Peacefully nestled among the range of snow-capped lofty mountains, Darjeeling is synonymous with three Ts, Tea, Tiger Hill and Toy Train, combined together. It is fondly and justifiably nicknamed as ‘The Queen of the Hills’. 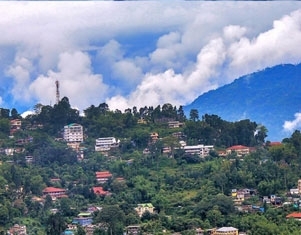 Gangtok, the capital city of Sikkim is located on a ridge at a height of 5500 feet. With a spectacular view of the Khangchendzonga, the town provides the perfect base for travel through the state. Arrive in Darjeeling. If you reach Darjeeling in the afternoon, then after checking in to your hotel and freshening up, come up to Chowrasta Mall, sit on a peripheral bench for a while, relax & enjoy the ambience and watch the activities. Go for the early morning 3-point tour which covers famous sunrise from Tiger Hill, Old Ghoom Monastery and Batasia Loop where the toy train takes a dramatic loop and negotiates an altitude of 140ft. Relax for a while and later take the 7-point local tour which includes Himalayan Mountaineering Institute, Zoological Park, Ropeway, Tibetan Self Help Refugee Center, Lebong Race Course, Happy Valley Tea Estate etc. This tour will take about 4 hours. Check out in the morning (by 8am), take a taxi from the stand and move to Gangtok (takes about 4 hours). Check into the hotel, freshen up and walk down to MG Marg, the hub of Gangtok - Smoke & vehicle free boulevard square with shops and restaurants lined up on both sides. A great place to sit on a bench and feel the carnival like ambience. Tsogmo Lake or Changu Lake is a glacial lake in the East Sikkim, India, approximately 40 kilometers / 25 miles away from Gangtok at altitude of nearly 3780 meters / 12400 feet. "Baba" Harbhajan Singh (August 3, 1941 – October 4, 1968) was an Indian army soldier who died near the Nathula Pass in India. He was revered by the soldiers of the Indian army who have built a shrine in his honour near the Lake at an altitude of around 4000 meters / 13123 feet. Legend has it that he appeared in a dream a few days after he went missing while patrolling the border, and expressed a desire that a monument be built his memory. Full Day Local sightseeing around Gangtok and Kalimpong.